It has been a while since I popped up a wish list therefore today I thought I’d share with you just a few things that I have being looking at recently. Starting off with the most gorgeous pyjamas to ever grace this earth we have the Hush Vintage Rose Pyjama set. These look super cosy and are so very beautiful, I honestly don’t think I’ve ever fallen for a pair of pyjamas in all my life; I guess there is a first for everything though! Being quite the fan of Charlotte Tilbury already it comes as no surprise to me to find another eye shadow quad cropping up on my wish list. The Sophisticate quad has four beautiful shades that look as though they would be simply perfect for day time this autumn. In contrast to summer where I tend to go for a simple winged liner and mascara I really like to up my game more at this time of year and pull out more of subtle smoky eye for both daytime and evening. Whilst we’re on the topic of eye shadow it would be rude of me to not include the new NARS Dual Intensity Eye Shadows as they have to be some of the nicest I have seen in a long time. In terms of quality, pigmentation and texture these are incredible whereby I have to say I have being looking at the shades Himalia and Callisto in particular although they all do look stunning. 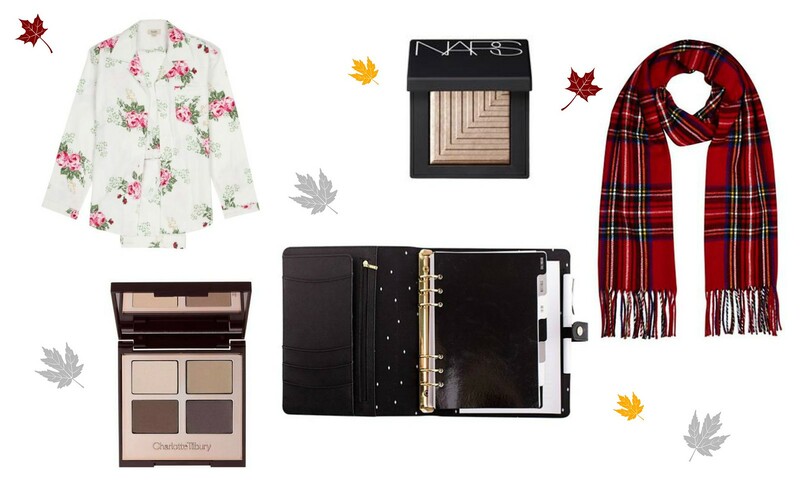 Last but most certainly not least is this Red Tartan Blanket Scarf from River Island. Every year I seem to try and hunt down the perfect tartan scarf but never seem to find one; this year will be different.